Welcome to Reception! 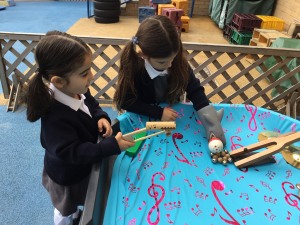 There are seven areas of learning and development we cover during Reception; all areas are inter-connected in order to ignite children’s enthusiasm and curiosity for learning. Children listen to stories, anticipating key events and sharing their ideas. They give their attention to what others say and respond appropriately. They answer ‘how’ and ‘why’ questions in response to stories and experiences. Children learn to express themselves effectively, using past, present and future forms accurately when talking about events that have happened or are to happen in the future. They develop their own narratives and explanations by connecting ideas or events. Children show good control and co-ordination in large and small movements. They move confidently in a range of ways, safely negotiating space. They handle equipment and tools effectively, including pencils for writing. Children learn the importance for good health of physical exercise, and a healthy diet, and talk about ways to keep healthy and safe. They manage their own basic hygiene and personal needs successfully. Children develop the confidence to try new activities, and say why they like some activities more than others. They are confident to speak in a familiar group, will talk about their ideas, and will choose the resources they need for their chosen activities. children play co-operatively, taking account of one another’s ideas about how to organise their activity. They show sensitivity to others’ needs and feelings, and form positive relationships. Children will talk about how they and others show feelings, talk about their own and others’ behaviour. They work as part of a group or class, and understand and follow the rules. Children learn to read and understand simple sentences. They use phonic knowledge to decode regular words and read them aloud accurately. They also read some common irregular words. They demonstrate understanding when talking with others about what they have read. 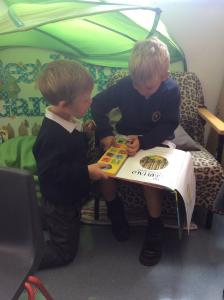 Children use their phonic knowledge to write words in ways which match their spoken sounds. They also write some irregular common words. They write simple sentences which can be read by themselves and others. 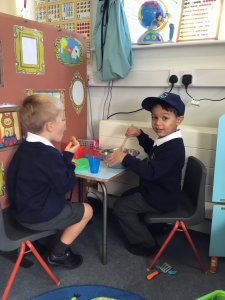 The school uses the ‘Letters and Sounds’ Phonics Programme to deliver phonics in the EYFS. This is supplemented with other phonics resources such as Jolly Phonics. Children count reliably with numbers from 1 to 20, place them in order and say which number is one more or one less than a given number. They add and subtract two single-digit numbers and count on or back to find the answer. They solve problems, including doubling, halving and sharing. 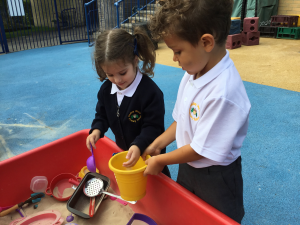 Children use everyday language to talk about size, weight, capacity, position, distance, time and money to compare quantities and objects and to solve problems. They recognise, create and describe patterns. Children talk about events in their own lives and in the lives of family members. They know that other children don’t always enjoy the same things, and are sensitive to this. Children will explore technology, places, objects, materials and living things. They talk about the features of their own immediate environment and how environments might vary from one another. Children sing songs, make music and dance, and experiment with ways of changing them. They will explore a variety of materials, tools and techniques, experimenting with colour, design, texture, form and function. Children use what they have learnt about media and materials in original ways, thinking about uses and purposes. They represent their own ideas, thoughts and feelings through design and technology, art, music, dance, role-play and stories.